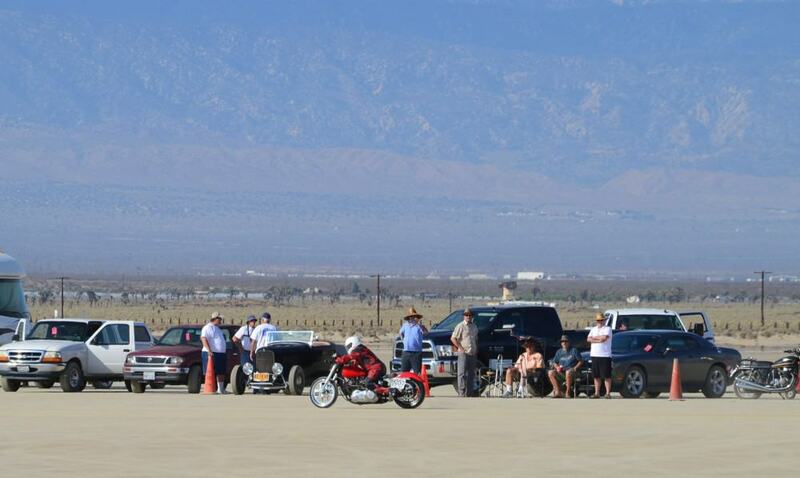 El Mirage Meet was fantastic!!!! 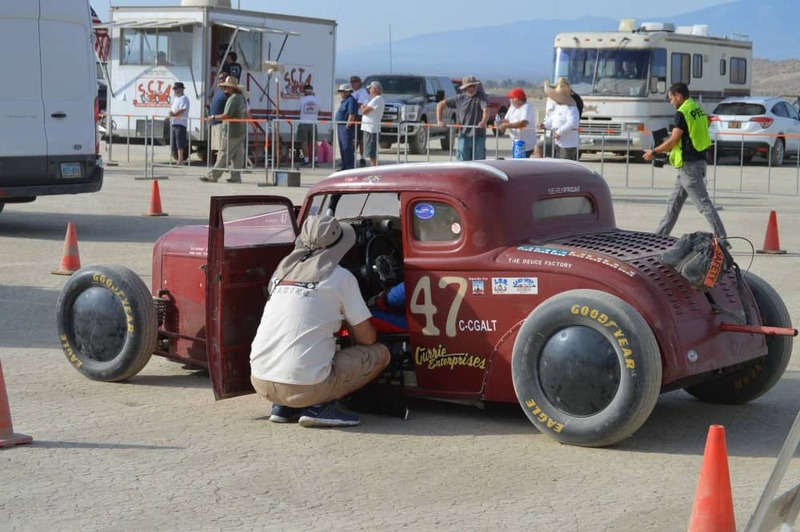 OK, for those of you who don’t know what Dry Lake racing is, its something way back after WW2 that many people came to in California to run their ModelA’s B’s and T’s, a souped up Jalopy that ran as hard as it could to set some sort of record or at least get into the books as a fast Speed trials car, thus HOT RODS were born and as far back as 1948 The SCTA -Southern California Timing Association was Born. 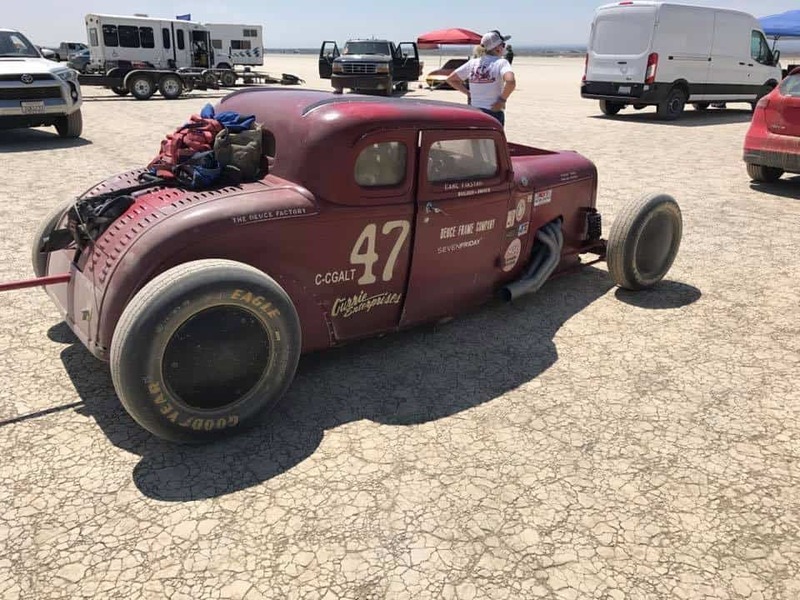 For all to see and do, these dry lakes, be it El Mirage, Muroc or Harpers etc, was a fun and wide open place to take your Hot Rod out to and go flat out with no cops giving you a ticket. 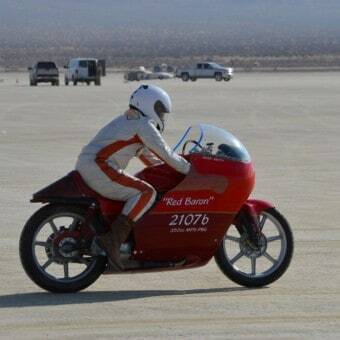 Oh yeah, and for Motorcycles, man- we have come a long way as well, this chap ran 207 on a back up 205 and is now in the 200MPH club, how cool is that? 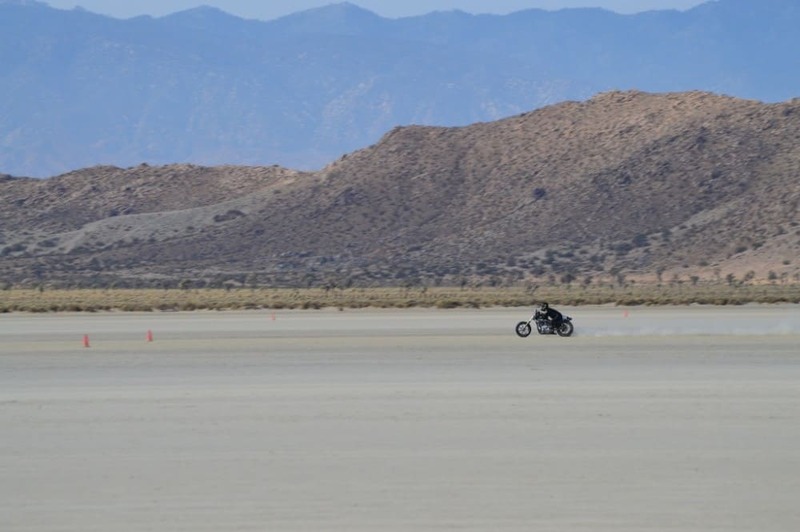 Here is some footage below that an SCTA member took of the 2015 meet, just to give you a little insight as to what goes on at the El Mirage dry lake. 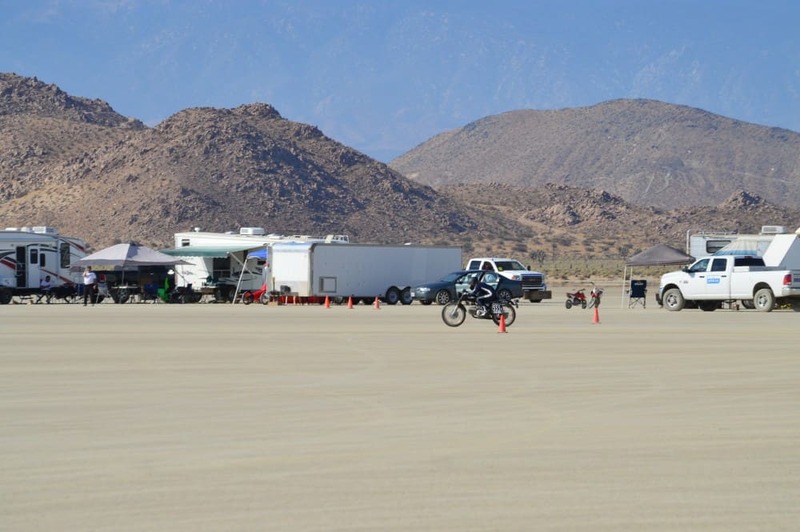 Here is some more El Mirage footage for you to watch if you cannot make it to these events. I never ever tire of this stuff and hope that you enjoy it as much too. 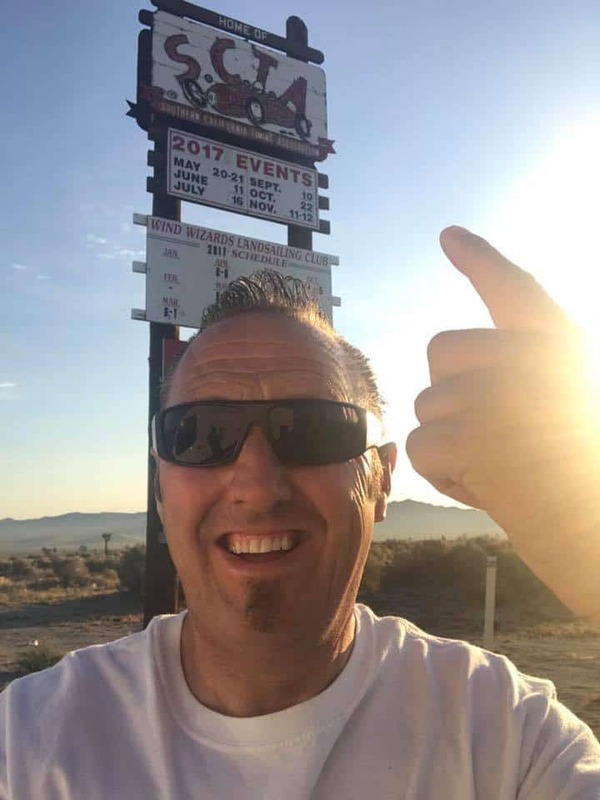 A super day out, I left at 4am and got here just before the Racing started and the temp was nice in the early hours but, soon warmed up. Next up was actual footage I took with my Iphone, so forgive me for audio and not television standard filming, i was enjoying it too much to try too hard. 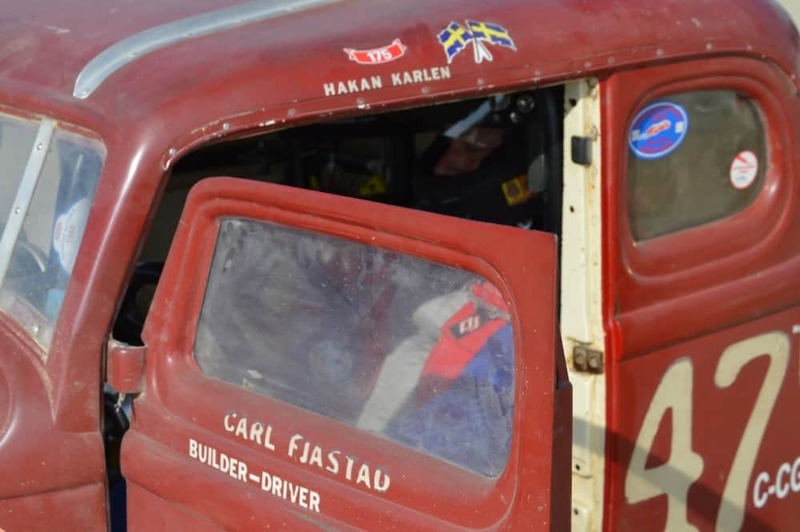 Håkan Karlen, a very cool Guy indeed and made me feel at home as soon as I arrived to the track at 6am. Taking it all in as I set up the Eazy up and get cold drinks sorted before it gets too damn hot as it will be over 100 degree’s here in about an hour. 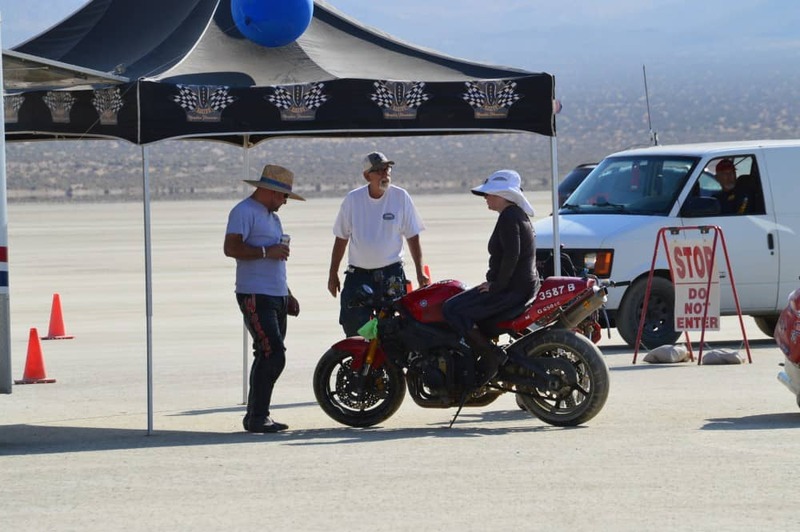 Motorcycles and Hot Rods pass All day, I had Jennifers Radio with me and tuned into the Control tower so i could hear who was racing and what machine they have, as well as what speed they hope to achieve of beat. 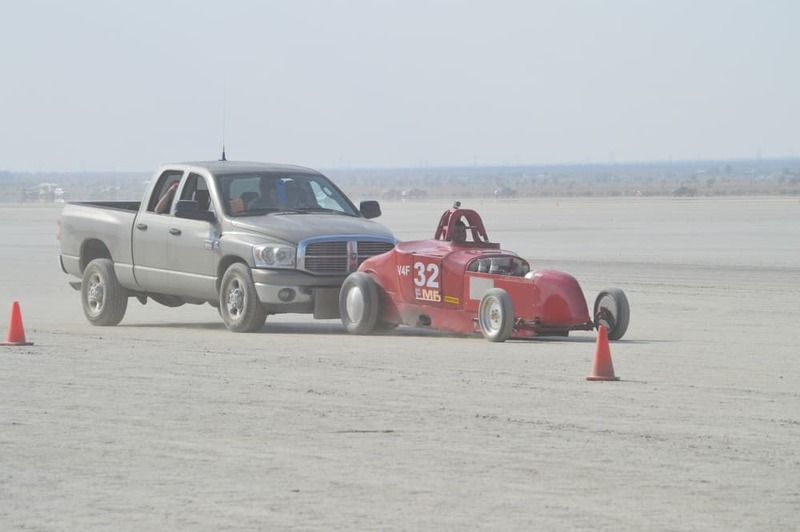 Staging lanes gets bloody hot and you hope nobody has a break down, or spin out as that can hold things up for a while. 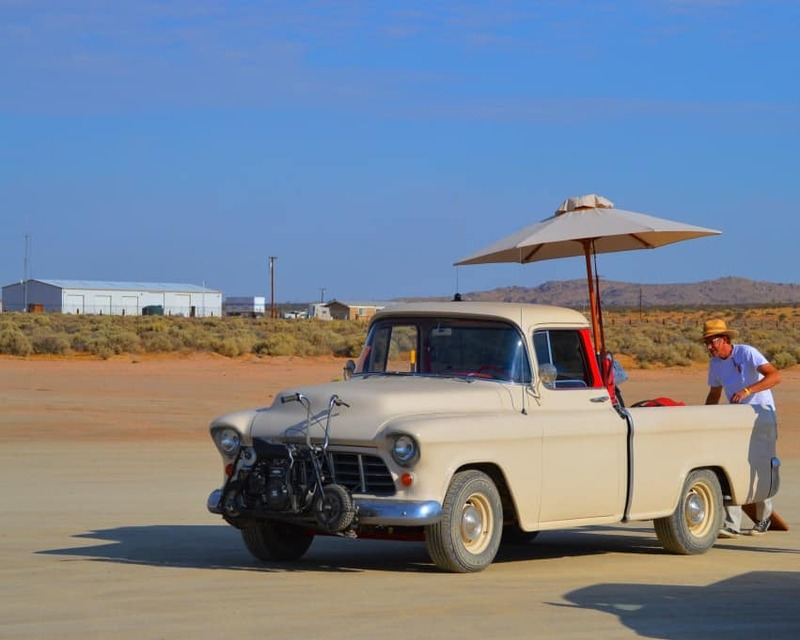 I am in the Push truck as the Flying Swede gets back on it in his 5 winchow chopped and channeled coupe. Hoping for a good run. 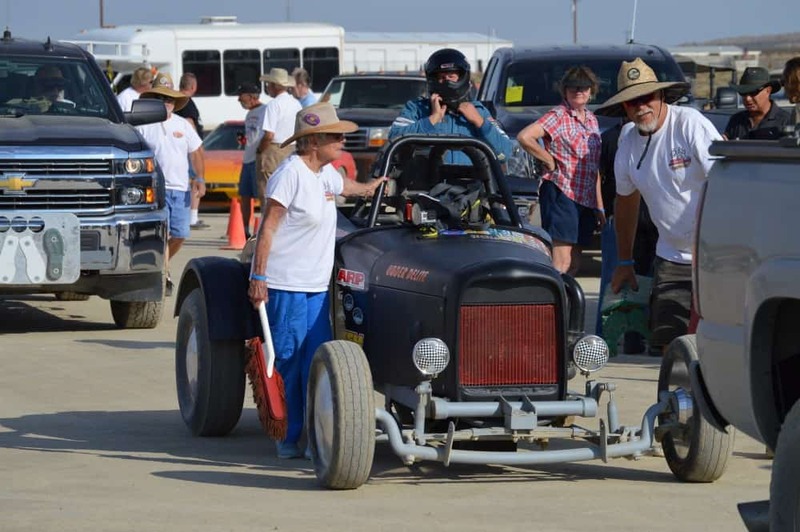 Last run of the say, 1927 Model T with later Motor, sounded wicked on the pipe. It was a superb day and lots to see and do, try and make it to a SCTA event as you may even get hooked into the sport like I am. 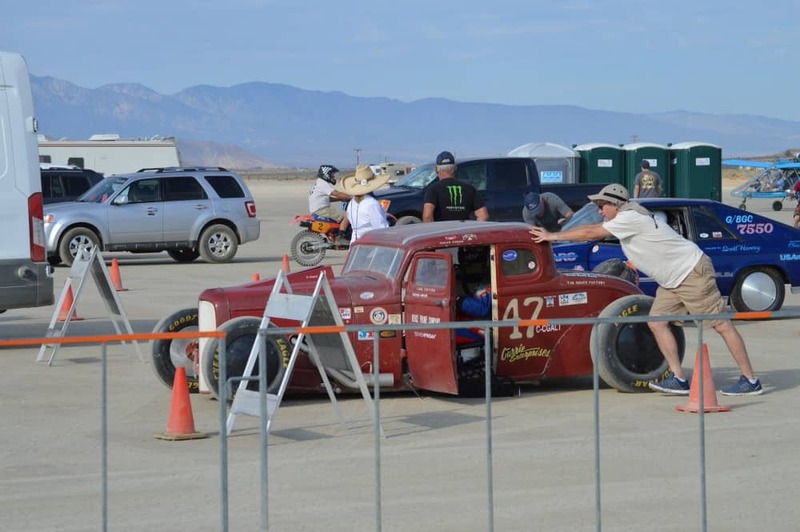 Below, Steve Rocketts Pushing the Flying swede Håkan Karlen in the staging lane, I helped push this coupe on the next go around, that is bloody heavy and my legs are still aching from pushing it. LOL! Here is Håkan Karlen sat waiting to take his turn to fire the V8 up on this coupe and go into the 180’s. 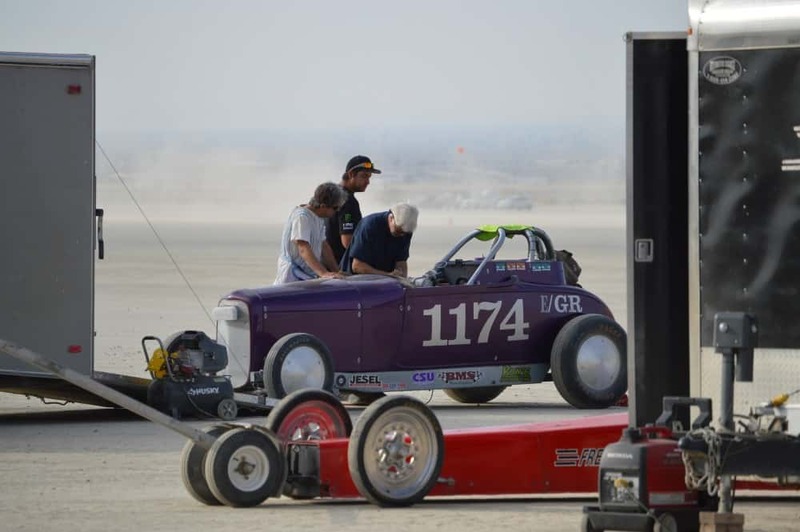 The heat was only going up- so trying to stay cool is the main thing at El Mirage and hope that the cross winds do not pick up on the course. 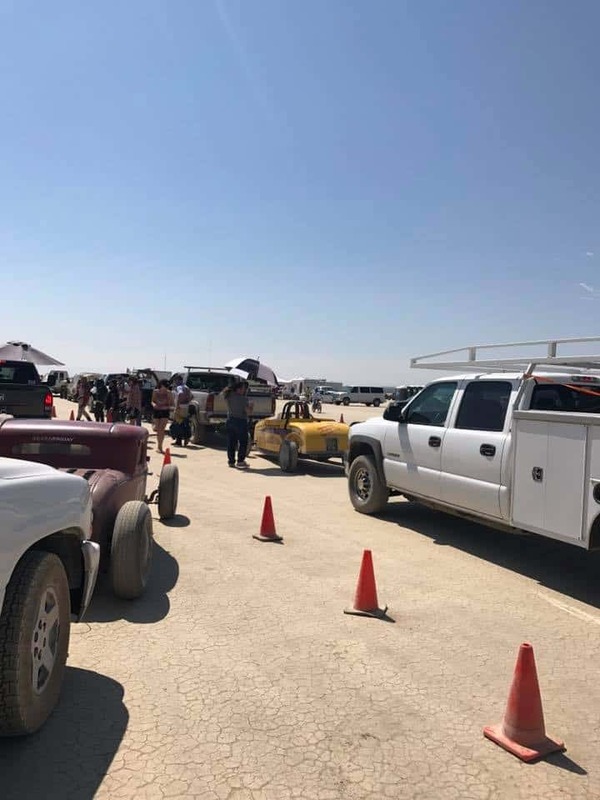 The good thing about this event is that you can get so close to all the action, everybody is so friendly and more than happy to help, its great commeraderie for sure. 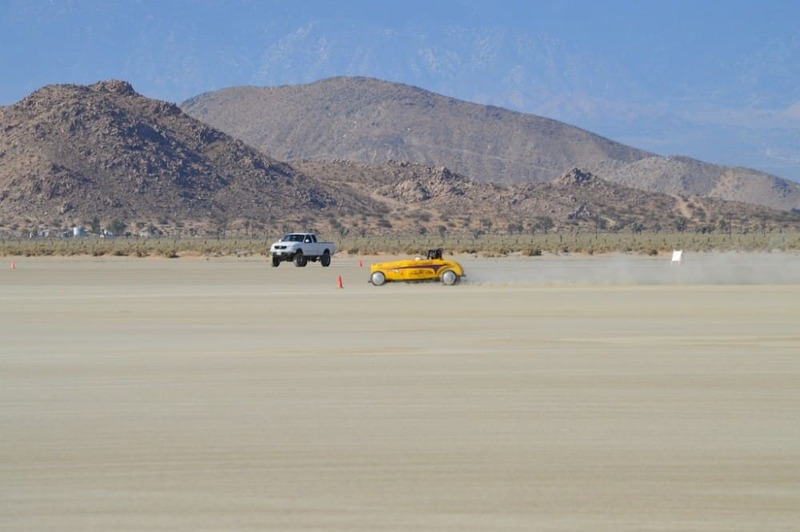 Below, wicked 29 Roadster getting set to take a run on the lake bed. 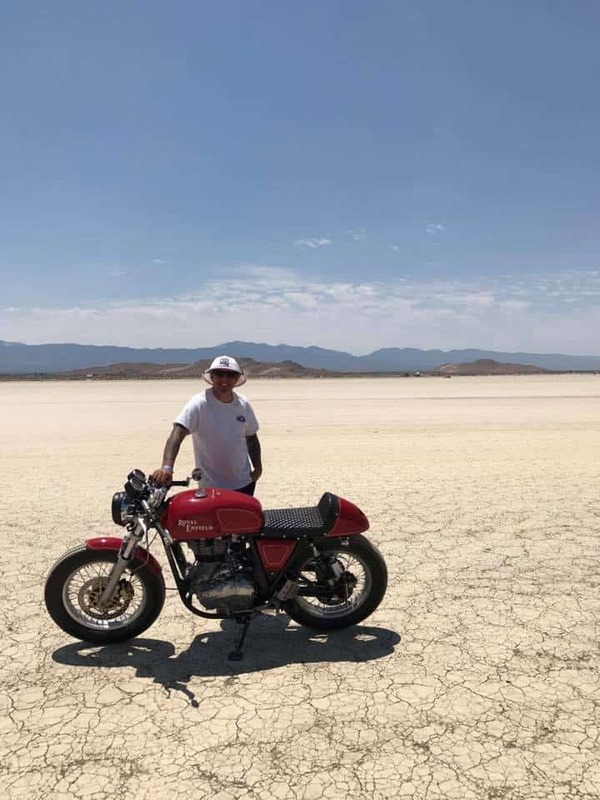 Plenty of Motorcycles too this time and another passion of mine as you well know, which has now lit a fire under my arse to maybe build a bike for the Dry lakes. 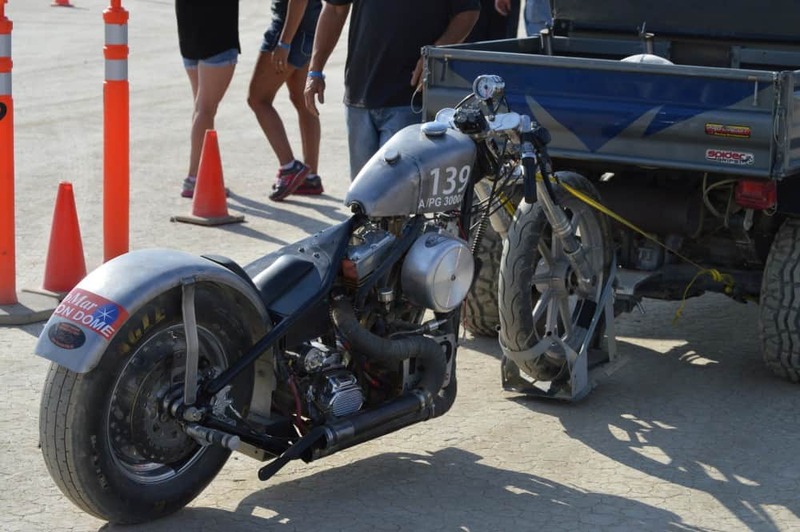 I loved some of the Motorcycles and the Rigs that towed them up to the track, check this combo out it was so cool to see. 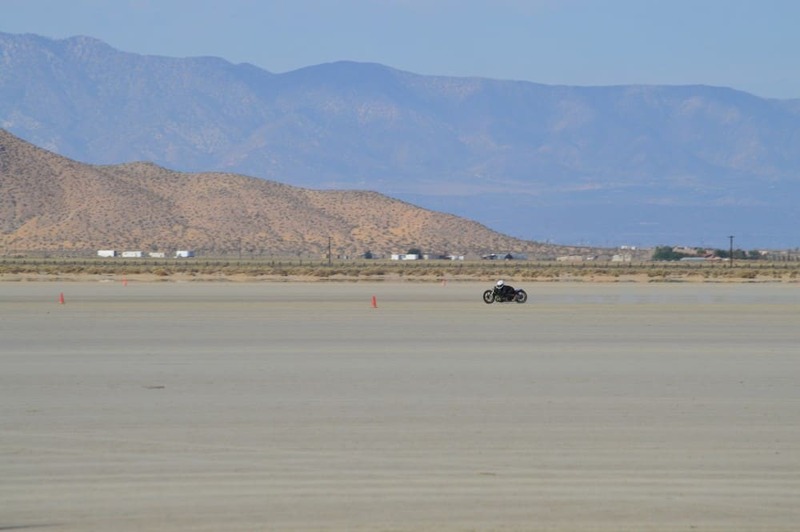 I really enjoy coming out to the dry lakes, its less than 2 hours from our house and some of the best spectating around. People starting their machines up and making sure they are running bang on , is fun to watch for me. If you dig Nostalgia, then this event is right up your street, I saw so many cool machines, it took me ages to see it all as the lake is bloody huge if you are walking. 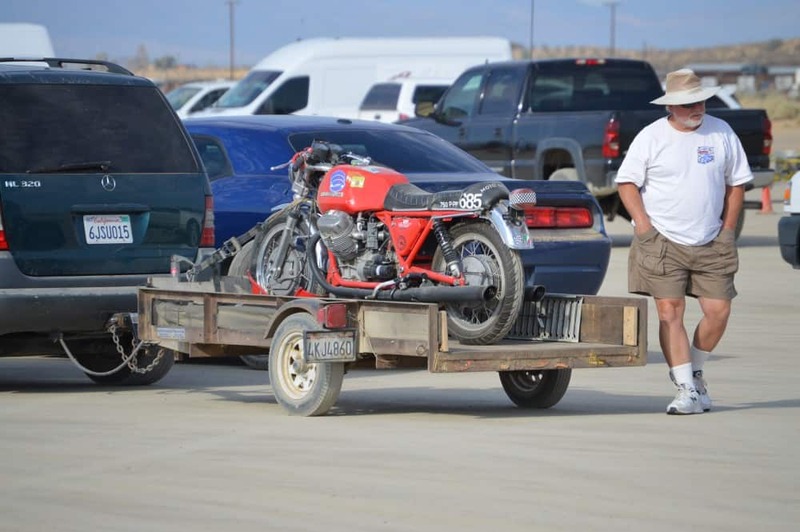 The bike above must of been going for the record of fastest towed motorcycle, as I saw that bike go up and down all day…behind that Mercedez. 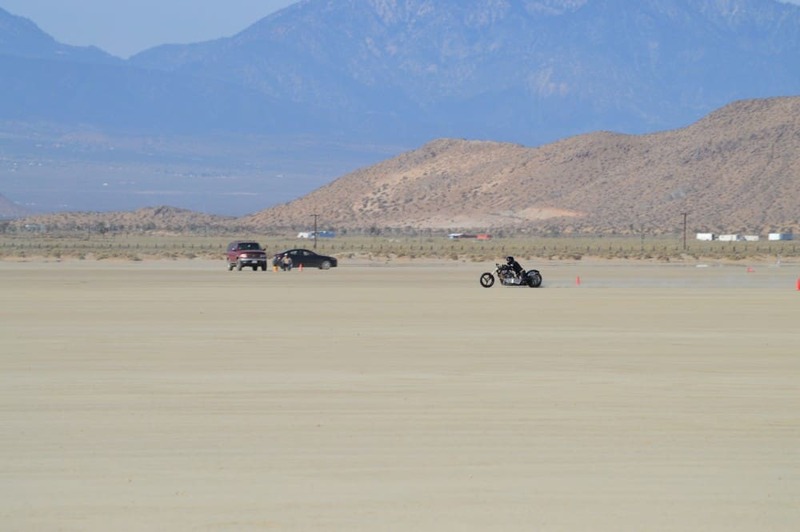 The good thing about this lake bed is that you can get to so many different areas, the course is marked off well and Track Marshall’s all over the place to keep you in check. 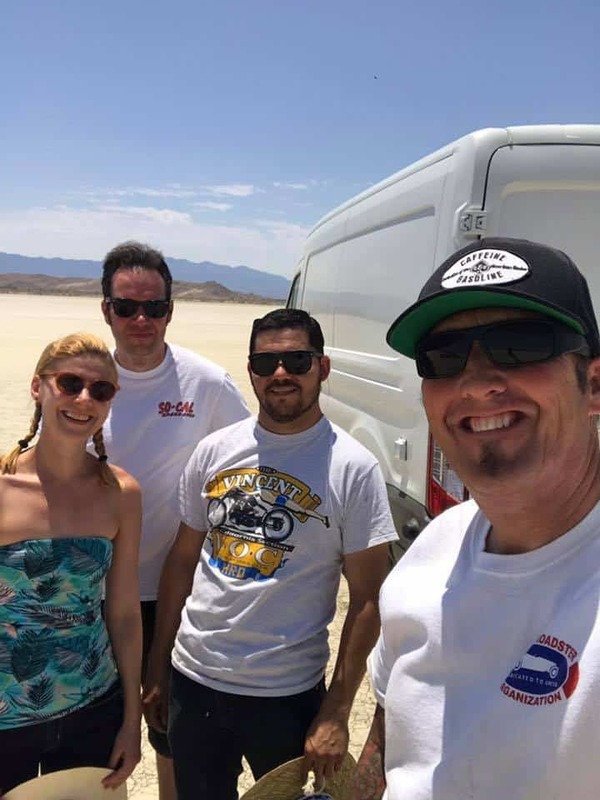 The sound, the smell, the heat, the excitement, its all here at El Mirage dry lakes, so try and make a trip out here as it is so much fun. Even Indians made a presence and that was great to watch going down the track. 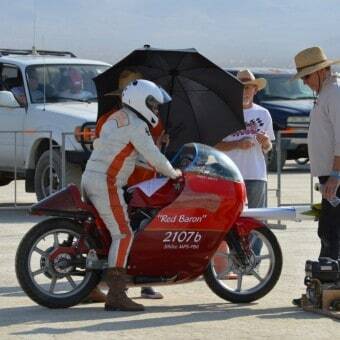 Above- Supercharged 350cc “Red Baron” Getting set to take his turn at the start line. 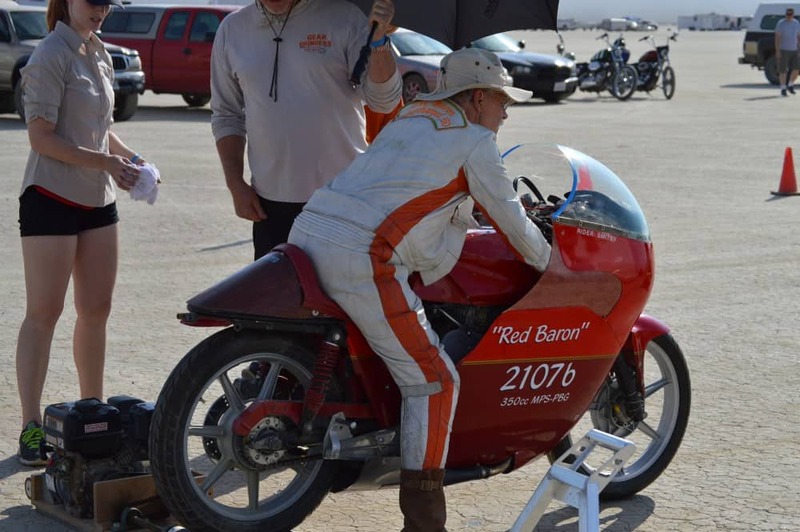 Great to see this bike and Old Fella give it the Beanz and belt off down the track, I knew he would get a fair speed up eventually, as i noticed how tiny his Rear sprocket was. 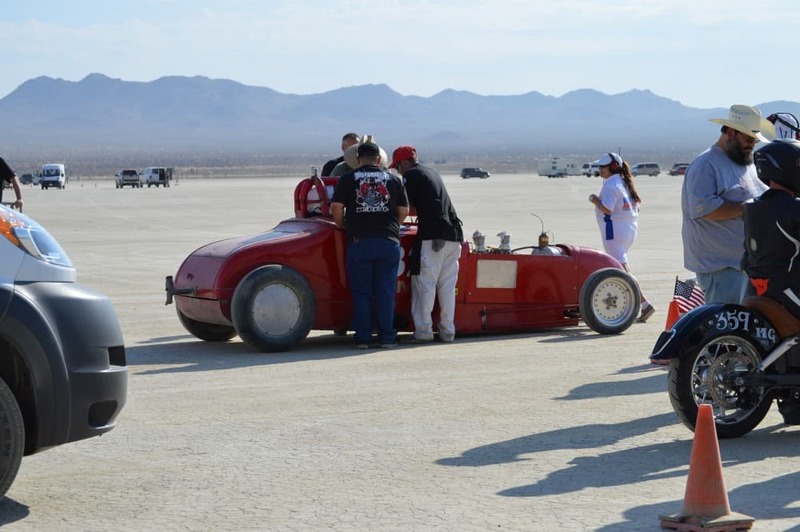 Another Roadster getting ready for the off, Loved every minute of it here on Sunday. 1927 Roadster this time, long wheel base and this hauled arse all day, sounded so nice on the pipe at half track. 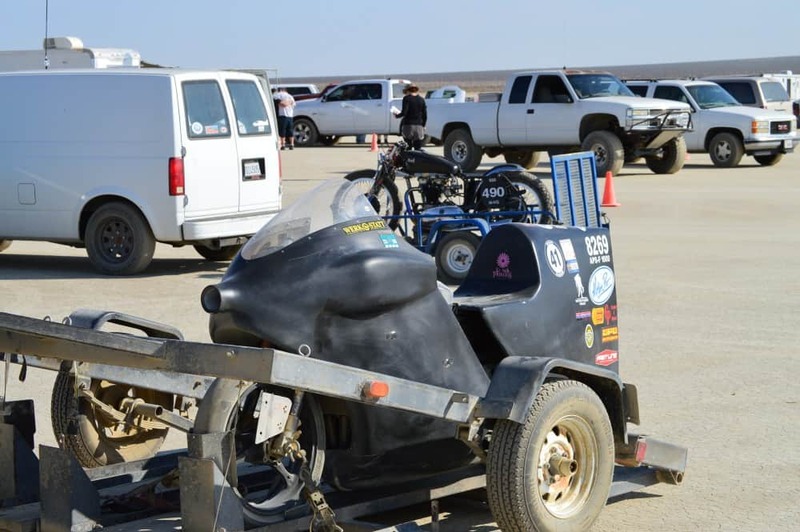 Harley with later Metric front end on is getting ready to be removed from trailer and run up the lake bed as fast as it can. Seemed to be plenty of Model A’s at the course at this meet, which I love, since I own a 1928 A Bone. Plenty going on in the Pits and look how close you can get to see all the action, a fantastic place to watch something you only get to see in magazines these days. The Sun was just starting to get warm in the early hours, but by 1pm is was cooking us all where ever you stood. 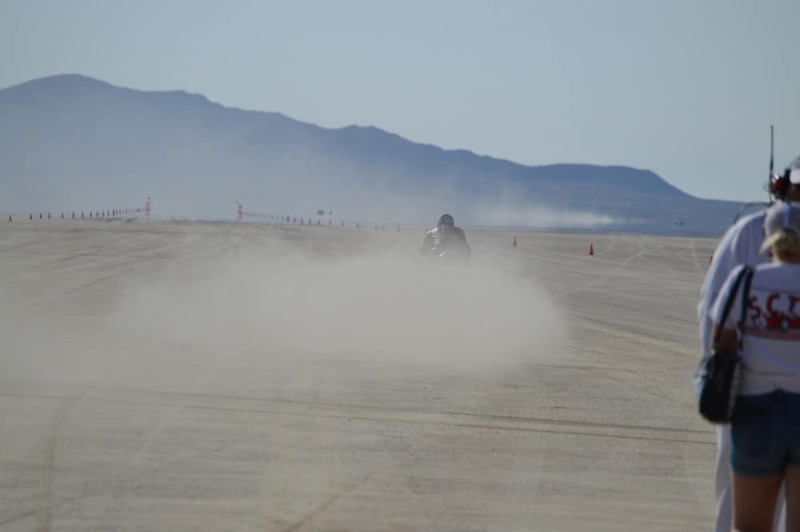 Little Harley Davidson Sprint was getting into the action and saw this machine do a few Full passes too. 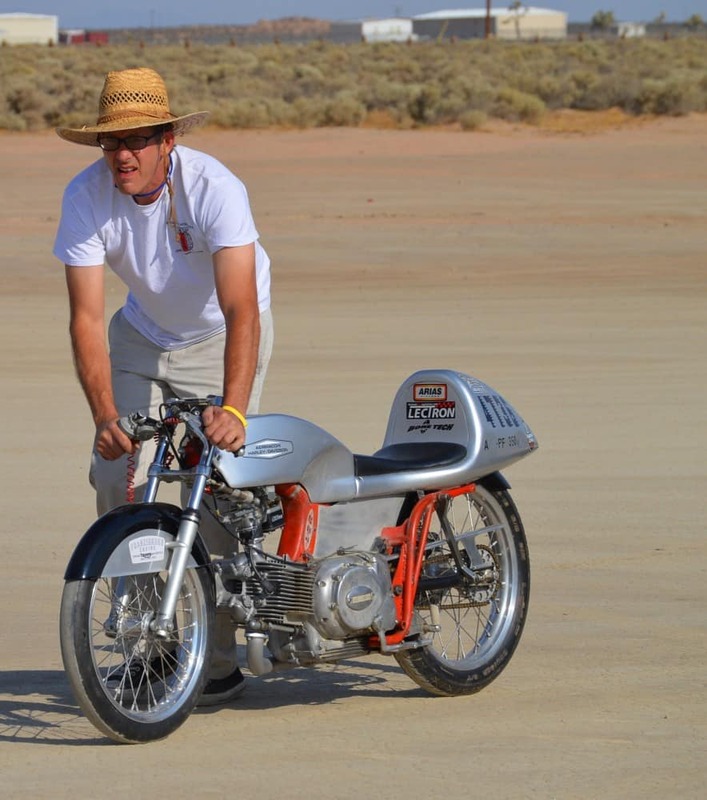 This Tiny 2 stroke turned a few heads and I was amazed at how tall the rider was, and secondly, how low the clip on’s were on the forks, new meaning to down in the dirt. 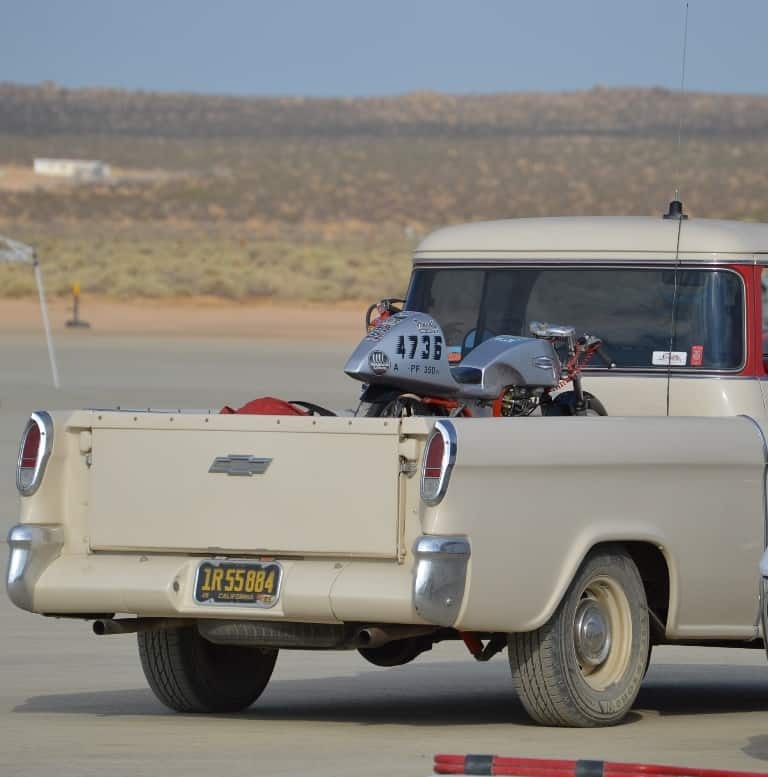 I loved this cameo Chevy Pick up with his Pit Bike on the front and little Harley racer in the back of the truck. 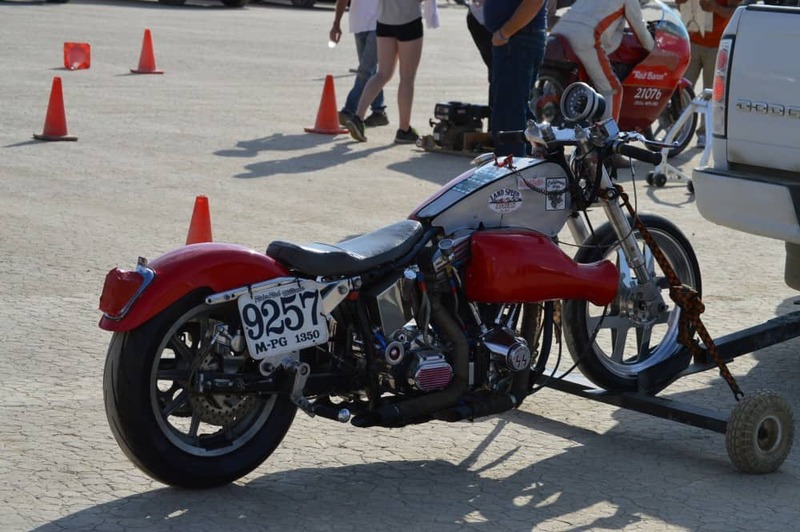 Above, this Harley was such a nice set up, plenty of time, sweat and tears must of gone into this little Speedster machine. 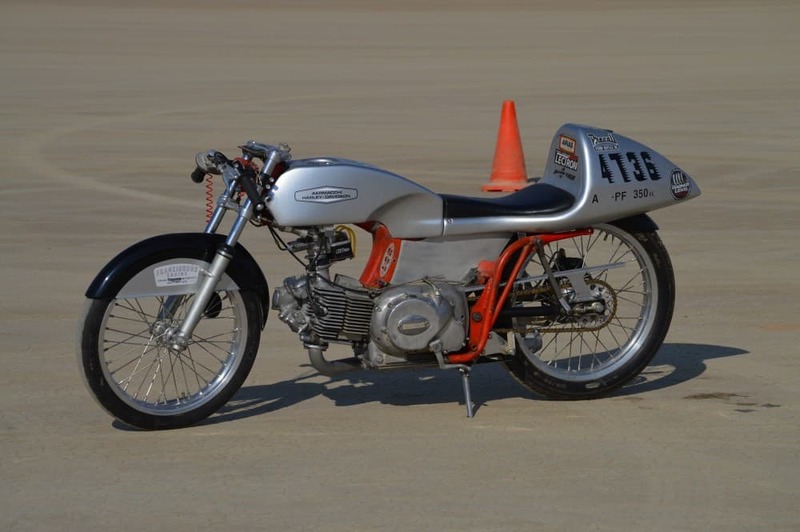 Another 350cc machine in the same class as others, looked to be a tough section to compete with but so much fun to watch and hear as they take off and get tucked into their little bikes. 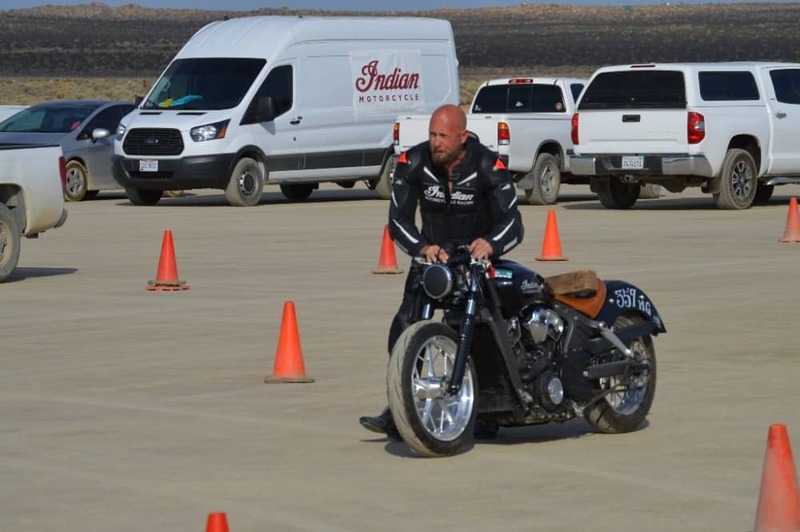 Getting ready down the staging lanes for this Harley Davidson Sprint to make some dust and go for a Record. 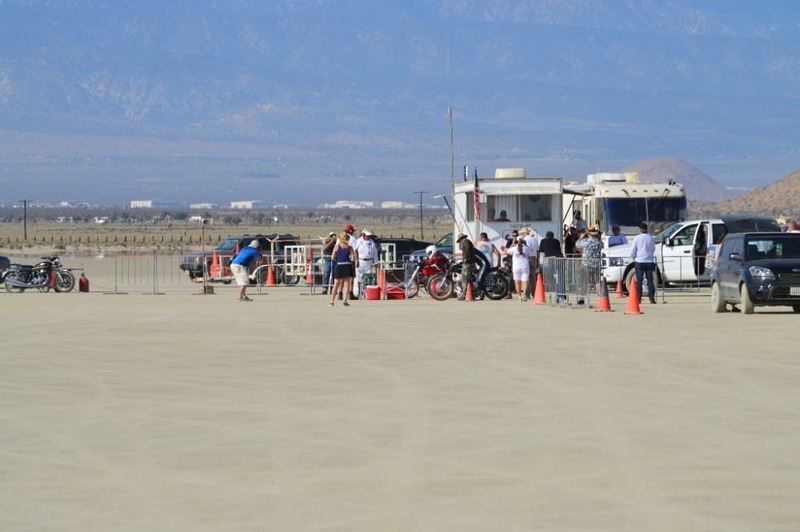 Getting the final OK from the Marshalls and are all set to go down this Dry lake for all its worth. 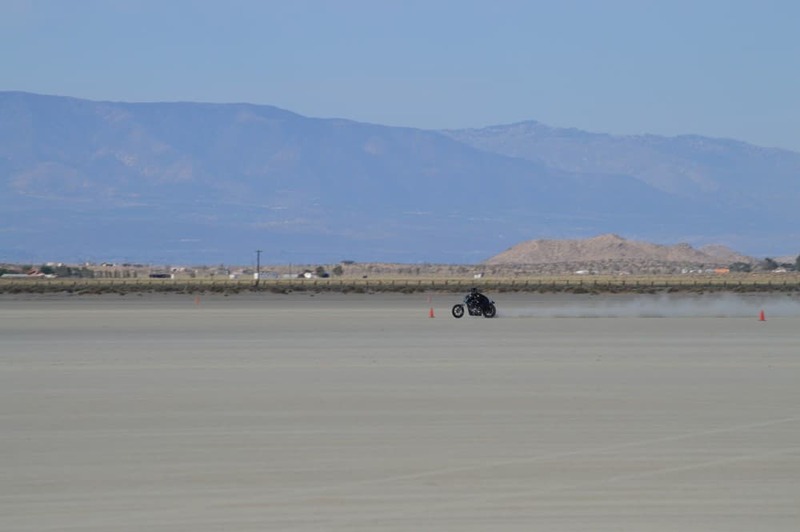 Off he goes and hoping to get a good time as he blasts forward and towards the mountains of El Mirage dry lake. 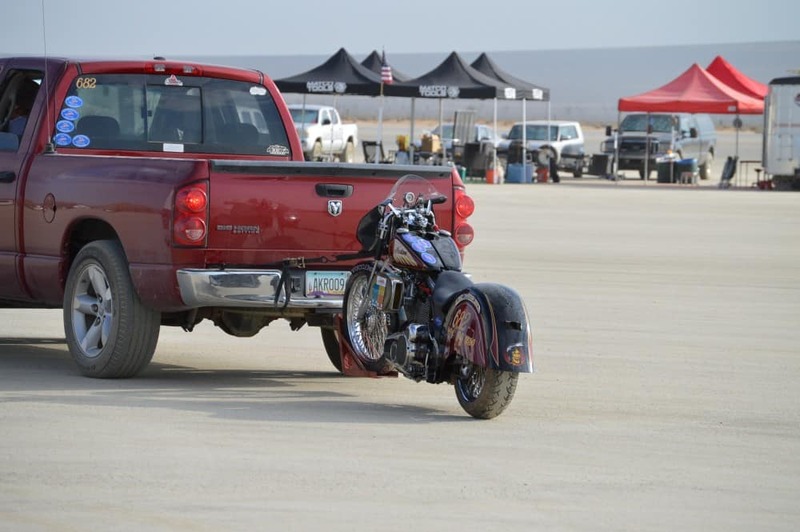 Looks like Harley Davidson was well represented for this Sunday meet on the lake. 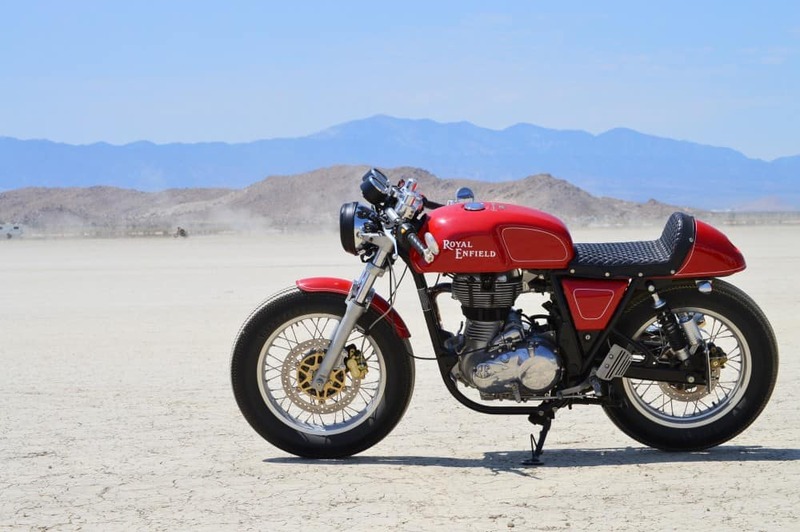 British Racing Green Triumph Thruxton bought these 2 to the lake bed. 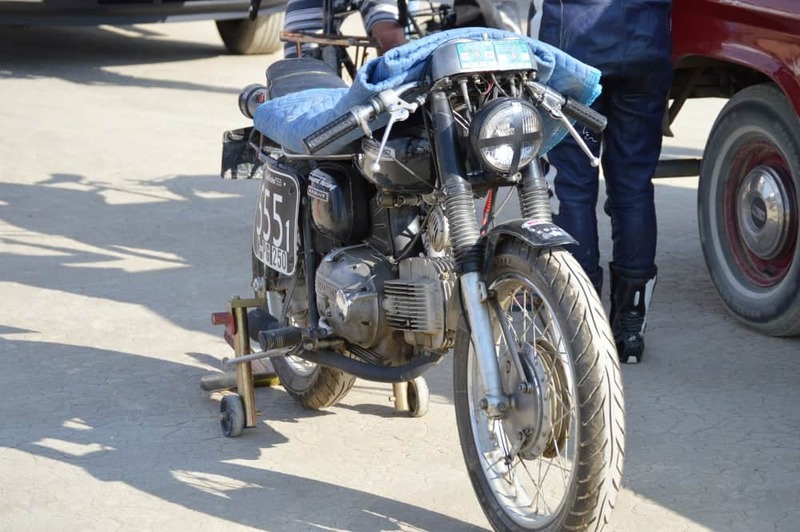 Little GS650 Getting scrutinized to make sure all is well, safe and within the parameters of whats allowed for that class of Motorcycle. 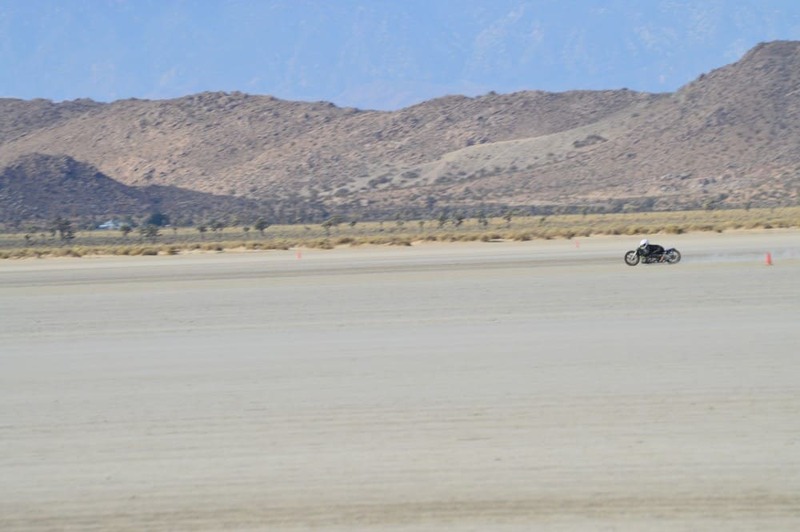 Above, I have no idea what Brand of Motorcycle this is but it sure is stealthy. 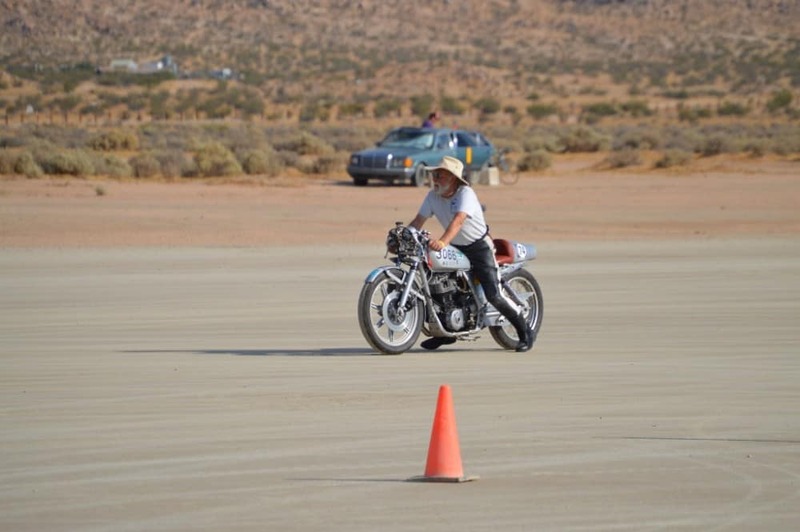 And below a V Twin has a go up the Course and looks great. 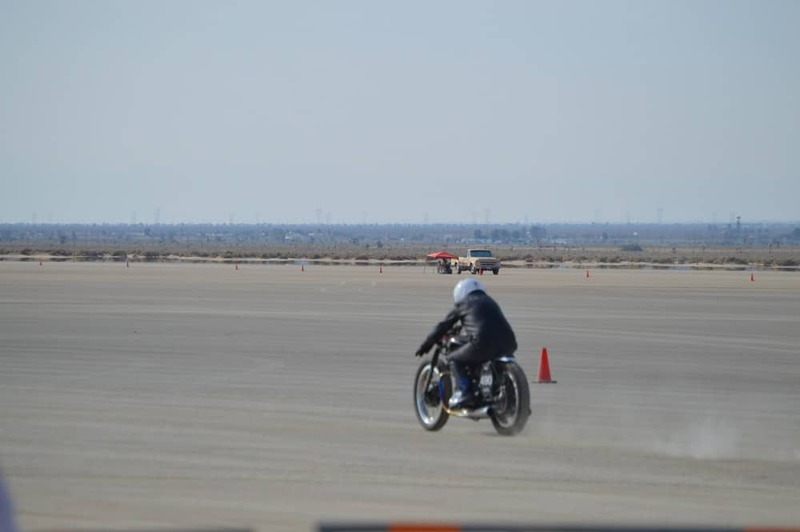 The weather was really good, it is always Hot but the wind stayed down for the races, and am sure glad I attended this SCTA event at El Mirage. 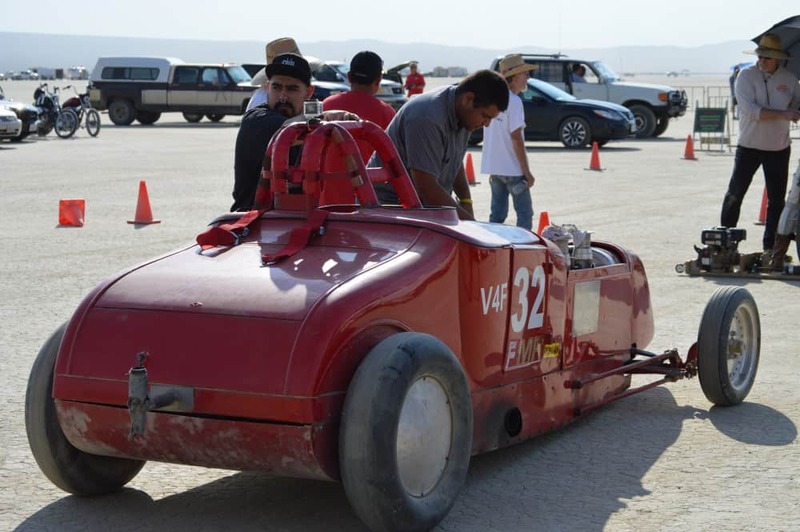 You will see many styles of Cars, bikes and Hot Rods at the dry lakes, a lot of work has gone into this Modified special and was fun to watch too. 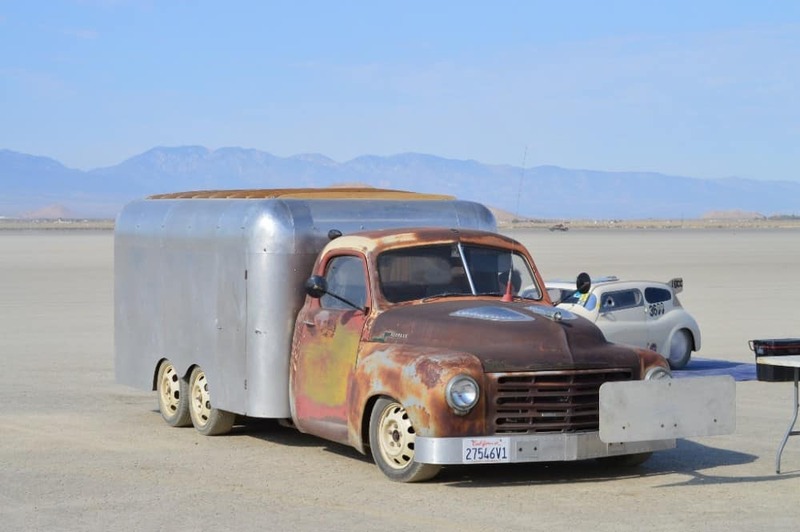 Above, the Push truck was very cool, a converted 1949 Studebaker Pick up, always loved the Spudbaker trucks but this is a cool push vehicle. 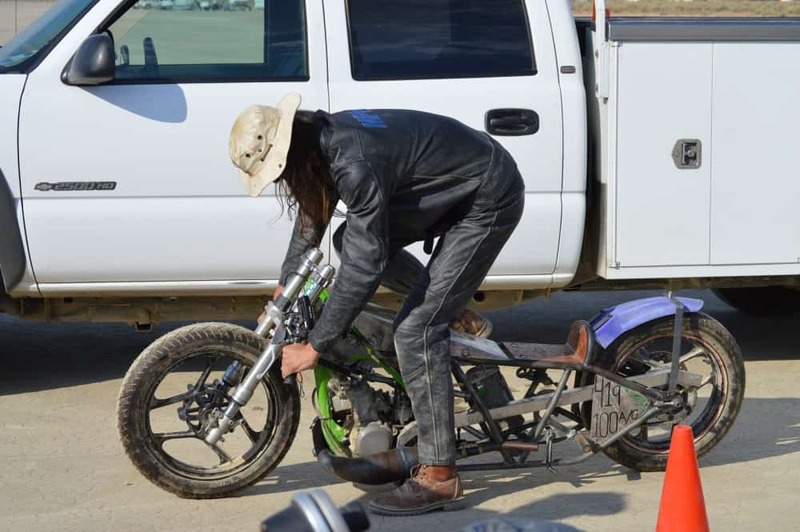 Giving it as much right hand as he can and these bikes are fun to watch and have me hooked thats for sure, just got to work out what class I would like to run in. 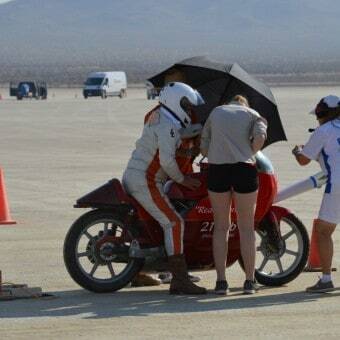 Must be such an exhilarating experience to be able to have an opportunity to have a go at this. 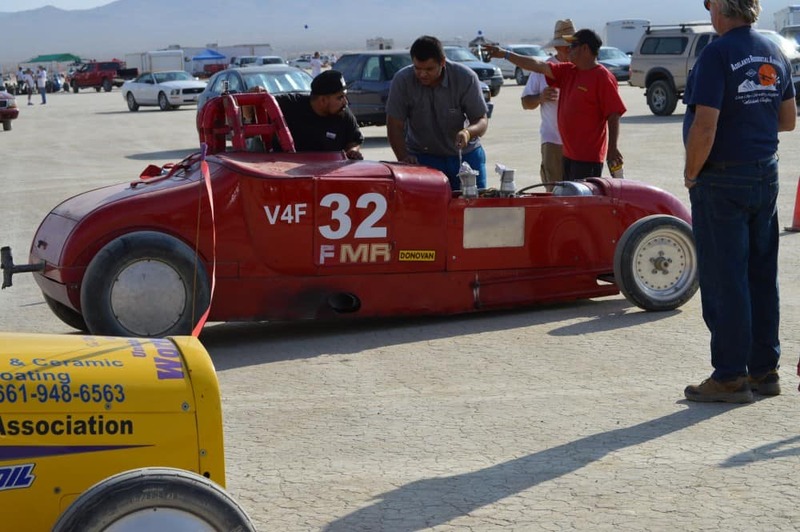 Roadster getting the Push, just love the whole racing experience here at El Mirage and in less than a month I will be in Utah for speed week at Bonneville. Now thats low to the ground and even though it is fast, it must feel twice as fast and feel every bump on the track but a whole lot of fun for sure. 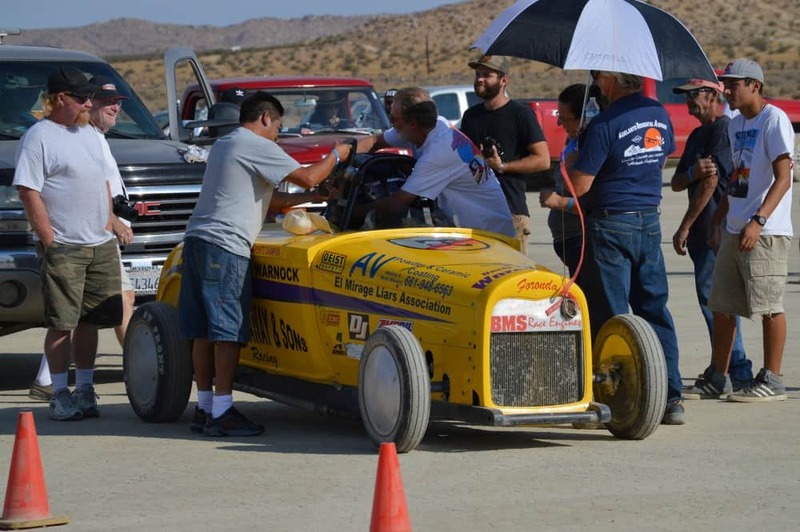 So next time you see an SCTA race posted, see if you can come along as I guarantee you will enjoy the whole experience at one of these meets. So glad I got here early to see the pits and races start at 7am as its a lot cooler in the morning and less dust to start off with. That is the start and the control tower where you can tune into 88.7 and hear the commentary where ever you have a radio. 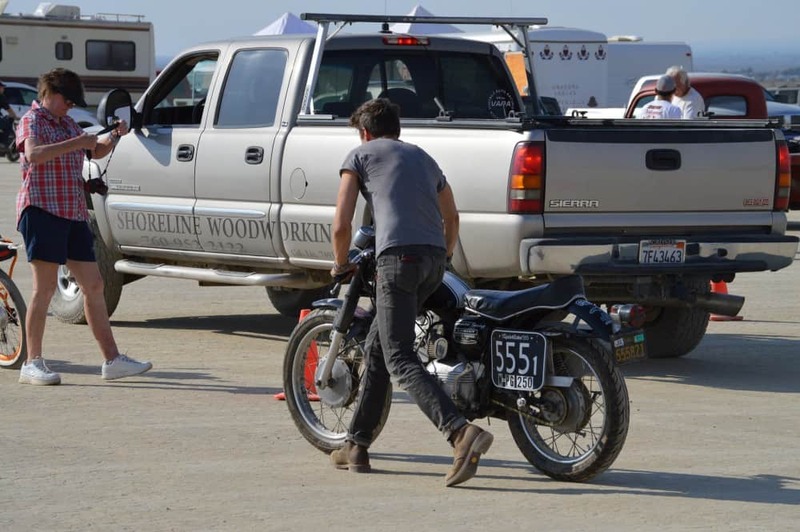 Great photo to me as the Harley heads of, Lovely Roadster sat there on the left and a 1978 CB750 Honda sat far right. 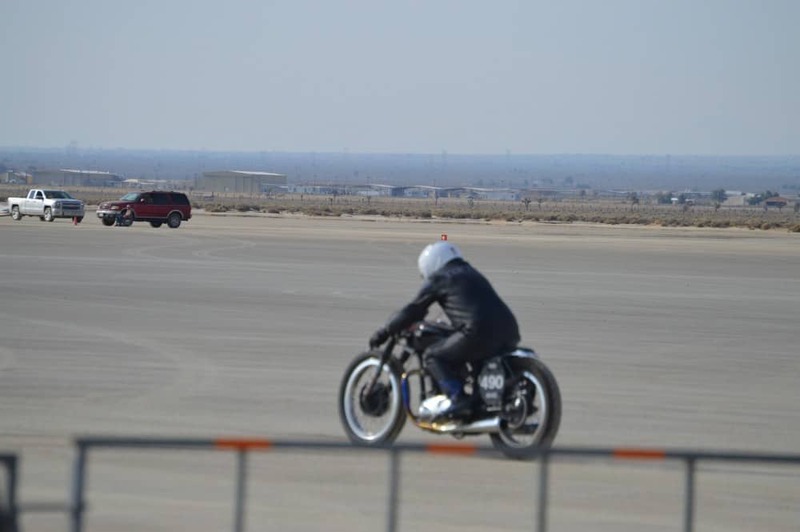 On the gas and sounding great.. Below, My Royal Enfield as I was parked Mid track, you can just make out a Motorcycle on the track flat out. 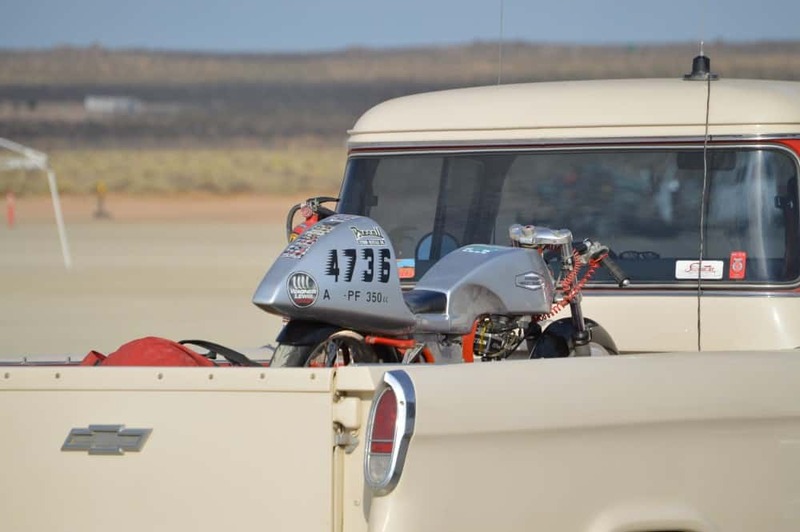 So a super day, I arrived early to stay in the cool check the pits out and get a good spot to park my Van and, get the Royal Enfield out. So stoked to make it here, always excited to come to this place and have to pinch myself sometimes to believe I am here. 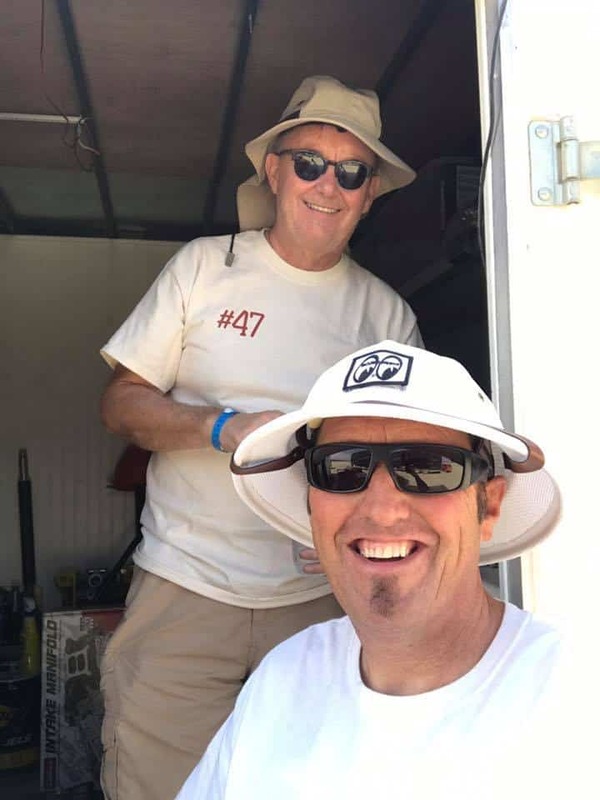 Yup, the Brits are here, Both of us are Steve’s too, me and Steve Ricketts hang out in between races. My buddy in the 59 Club Eduardo came to visit and brought along a couple of buddies from Finland Timo and his wife. 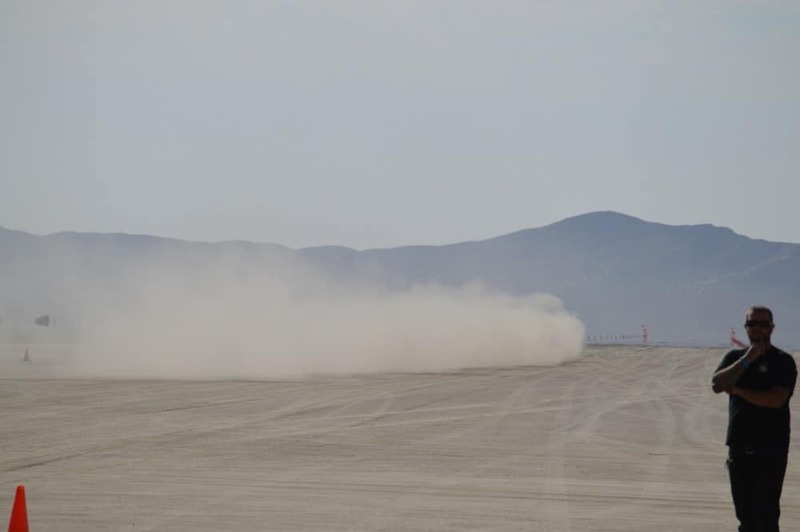 Hard to believe that I am here, you can Just make out a Motorcycle giving it the Beanz in the background. 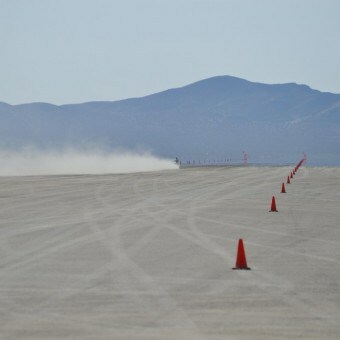 Staging lanes as we push Hakans Coupe to the start for a 183 run along the Lake bed. 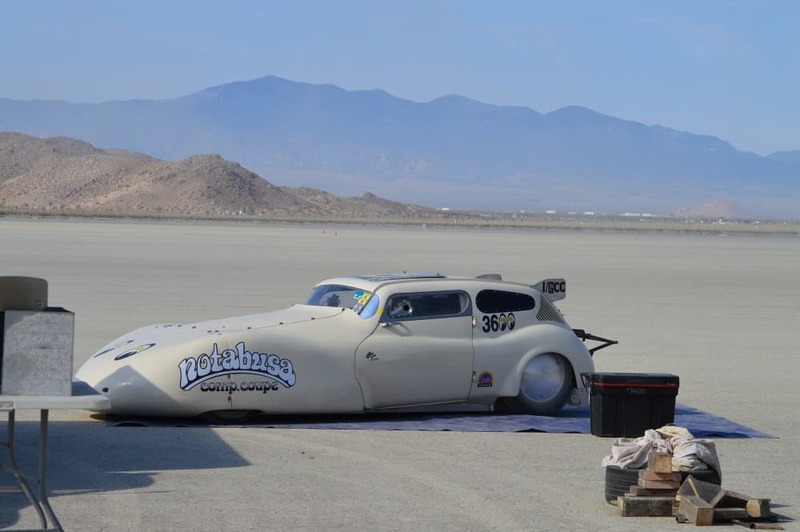 The Flying Swede ” Hakan Karlens Deuce Coupe is super reliable and consistent, that’s a well built Hot Rod right there. 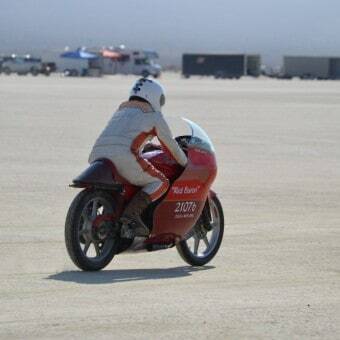 Next stop Bonneville Utah for Speed week, will be seeing friends, maybe even wrenching a little too and my girlfriend is taking me out there as this is a life long trip I have wanted as a kid in the UK, and in 23 days, 15 hours and 31 seconds, Jennifer sun and I will be on our way to the Salt flats. Hope to see some of you there, should be a great time and will blog about that one when I get back. Thanks for reading, hope you enjoyed this. 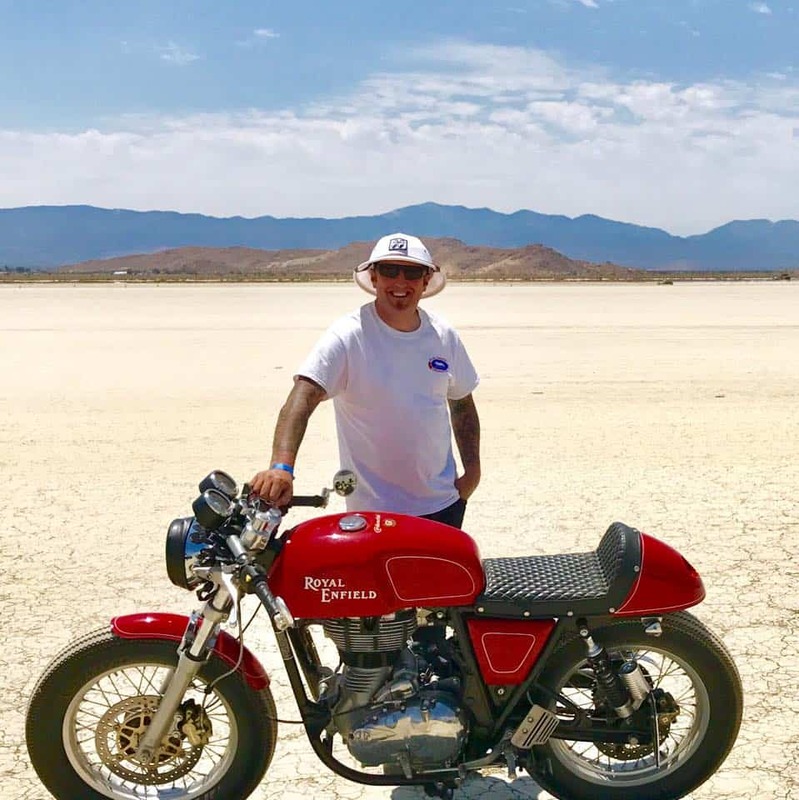 This entry was posted in Blog and tagged 59 club, big block, bonneville, cafe racer, coupe, drag, dry lake racing, el mirage, flathead, harley, hot rod, roadster, royal enfield, scrambler, scta, small block, Swedes, t100, thruxton, ton up, tracker, triumph, vintage motorcycle, wide open.